While there are several types of pancreatic cancer, the vast majority (more than 90 percent) of all diagnoses are for adenocarcinoma of the pancreas. When you read about classic symptoms or prognosis of pancreatic cancer, you are typically reading about adenocarcinoma. Pancreatic cancer types can be divided into two larger categories: exocrine pancreatic cancer, which includes adenocarcinoma, and neuroendocrine pancreatic cancer. Each category has several cancer types that may vary in their symptoms and prognosis. 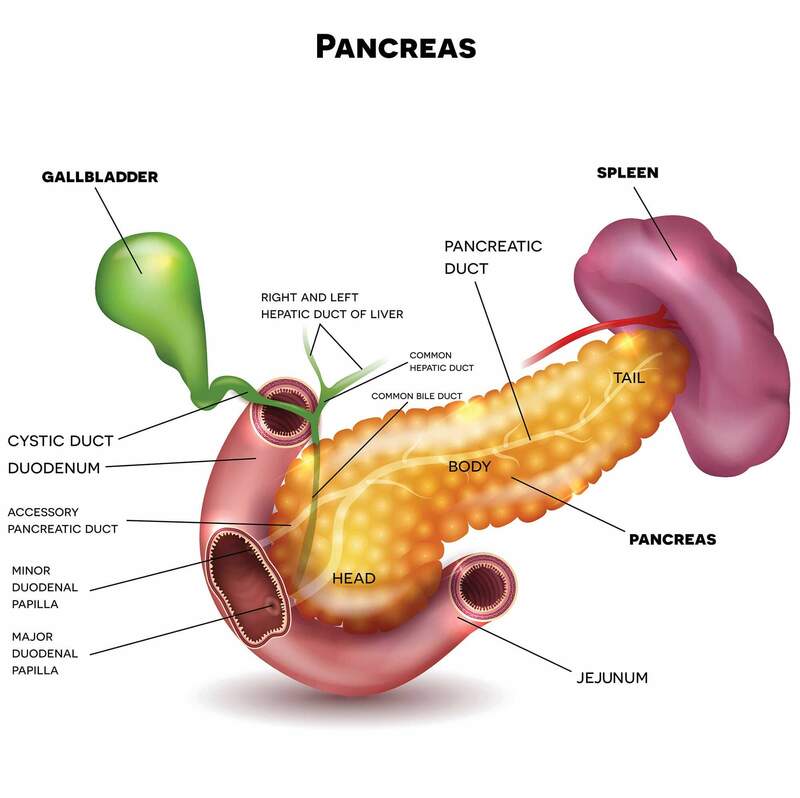 Exocrine pancreatic cancer develops from exocrine cells, which make up the exocrine gland and ducts of the pancreas. The exocrine gland secretes enzymes that help break down carbohydrates, fats, proteins and acids in the duodenum. Also called ductal carcinoma, adenocarcinoma, is the most common type of pancreatic cancer, accounting for more than 90 percent of pancreatic cancer diagnoses. This cancer occurs in the lining of the ducts in the pancreas. It’s also possible for adenocarcinoma to develop from the cells that create pancreatic enzymes. When this occurs, it is called acinar cell carcinoma, which accounts for 1 percent to 2 percent of exocrine cancers. Acinar cell carcinoma symptoms are similar to the symptoms of adenocarcinoma, which include abdominal pain, nausea and weight loss. However, jaundice is not as common. Due to an increase in enzymes, some patients may have skin rashes and joint pain. This extremely rare nonendocrine cancer of the pancreas forms in the pancreatic ducts, and is made purely of squamous cells, which are not typically seen in the pancreas. There have not been enough reported cases of this disease for its origins to be fully understood. Studies have reported that it has a very bad prognosis due to most cases being discovered after metastasis. This rare type of pancreatic cancer represents 1 percent to 4 percent of exocrine pancreatic cancers. Compared with adenocarcinoma, adenosquamous carcinoma is a more aggressive tumor with a poorer prognosis. These tumors show characteristics of both ductal adenocarcinoma and squamous cell carcinoma. Another rare type, colloid carcinomas account for 1 percent to 3 percent of exocrine pancreatic cancers. These tumors tend to develop from a type of benign cyst called an intraductal papillary mucinous neoplasm (IPMN). Because the pancreatic colloid tumor consists of malignant cells that float in a gelatinous substance called mucin, it is not as likely to spread and is easier to treat than other pancreatic cancers. It also has a much better prognosis. Pancreatic neuroendocrine tumors (NETs) develop from cells in the endocrine gland of the pancreas, which secretes the hormones insulin and glucagon into the bloodstream to regulate blood sugar. Also known as endocrine or islet cell tumors, neuroendocrine cancers are rare, making up less than 5 percent of all pancreatic cancer cases. Cysts and other benign tumors can form in the pancreas, and some can be precursors to pancreatic cancer, including intraductal papillary-mucinous neoplasms (IPMNs). Often, IPMNs and other benign lesions are found when a patient is being scanned for an unrelated medical reason. Depending on the location and type of the growth, your doctor may want to either surgically remove the lesion or continue monitoring it to ensure that it does not become malignant.